Here is the monthly CPC update for April and is not great news for those who like to track a lot of systems in the North Atlantic Basin. Synopsis: A weak El Nino is likely to continue through the Northern Hemisphere summer 2019 (65% chance) and possibly fall (50-55% chance). 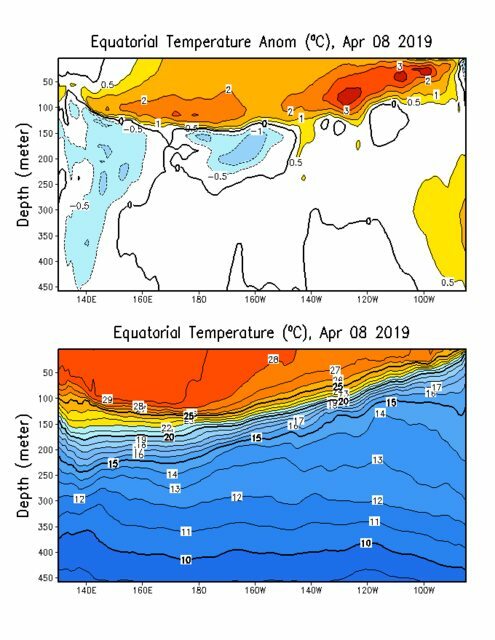 El Niño continued during March 2019, as above-average sea surface temperatures (SSTs) persisted across the equatorial Pacific Ocean [Fig. 1]. The latest weekly values of the Niño3 and Niño4 indices were +0.8°C, while the Niño3.4 value was +0.9°C [Fig. 2]. The anomalous upper-ocean heat content (averaged across 180°-100°W) decreased during March but remained well above average [Fig. 3], as the above-average temperatures at depth peaked in early March in association with a downwelling equatorial oceanic Kelvin wave [Fig. 4]. Enhanced equatorial convection was observed near the Date Line and in the western Pacific, while suppressed convection prevailed over western Indonesia [Fig. 5]. Low-level wind anomalies were westerly in the western Pacific Ocean during March. Meanwhile, upper-level winds were mostly near average. The equatorial and traditional Southern Oscillation Index values were negative. Overall, these features are consistent with a weak El Niño. 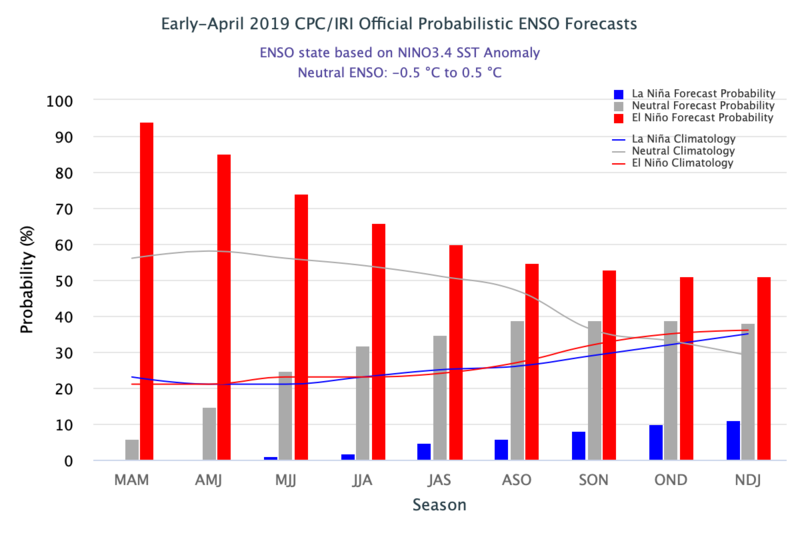 The majority of models in the IRI/CPC plume predict a Niño 3.4 index of +0.5°C or greater through the remainder of 2019 [Fig. 6]. Most forecasters expect SST anomalies in the Niño 3.4 region to remain between +0.5°C and +1.0°C for at least the next several seasons, indicating a weak El Niño. However, because forecasts made during spring tend to be less accurate, the predicted chance that El Niño will persist through fall is currently 50-55%. In summary, a weak El Niño is likely to continue through the Northern Hemisphere summer 2019 (65% chance) and possibly fall (50-55% chance; click CPC/IRI consensus forecast for the chance of each outcome for each 3-month period). Well, that's a big shift. Large uncertainty remains, and it always could shift back. But it's a marked change from the model showing El Nino continuing for the past several months. CyclonicFury wrote: Well, that's a big shift. Large uncertainty remains, and it always could shift back. But it's a marked change from the model showing El Nino continuing for the past several months. Wow, that's a huge shift from even this morning! Note the blue lines - those are the latest members. Where are they? Mostly supporting the current trend. 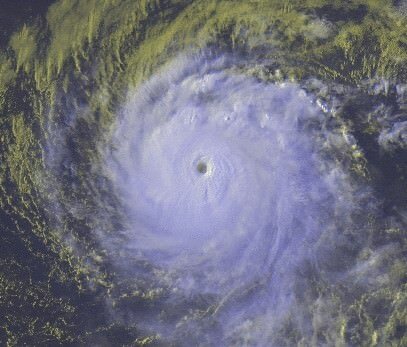 As CyclonicFury said, it can easily trend back, but all trends should be monitored regardless. The La Niña solutions do not seem likely unless the cold pool significantly strengthens. I wonder if this model is missing data because of the buoy problems. However, the subsurface warm pool in the Pacific has shrunk and weakened. 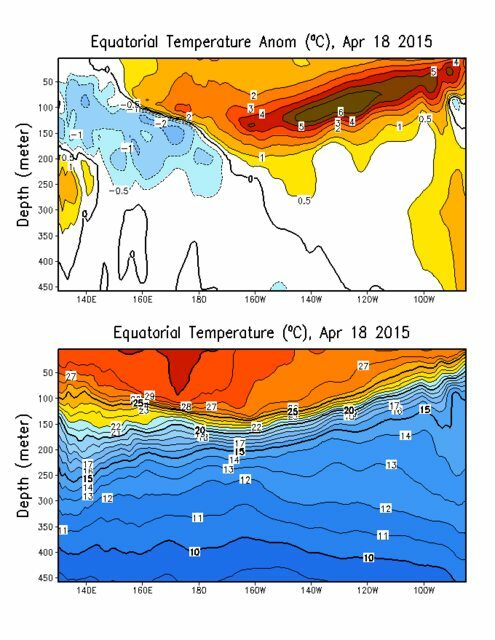 If a downwelling Kelvin Wave does not trigger the development of a new warm pool, El Niño could be in trouble. That CFS is graphic is much more accurate and believable. Looks like there's enough juice at the subsurface for weak Nino conditions to continue until August. We also still have great deal of MJO activity left that will tilt the scale one way or the other. Wait why is this graphic different than the one CyclonicFury posted? Kingarabian wrote: Wait why is this graphic different than the one CyclonicFury posted? That graphic uses the initial conditions of March 13-22 for its data. That's not the most recent members. The CFSv2 is subject to some noise so it will be interesting to see what the newest members show in a week or two. Good analysis. Problem is +PMMs are just part of the puzzle. They're evident during El Ninos but they seem to be byproducts of whatever that is that triggers El Ninos. I think ENSO is the main driver for +PDO regimes and +PMMs. The latter dont drive it. 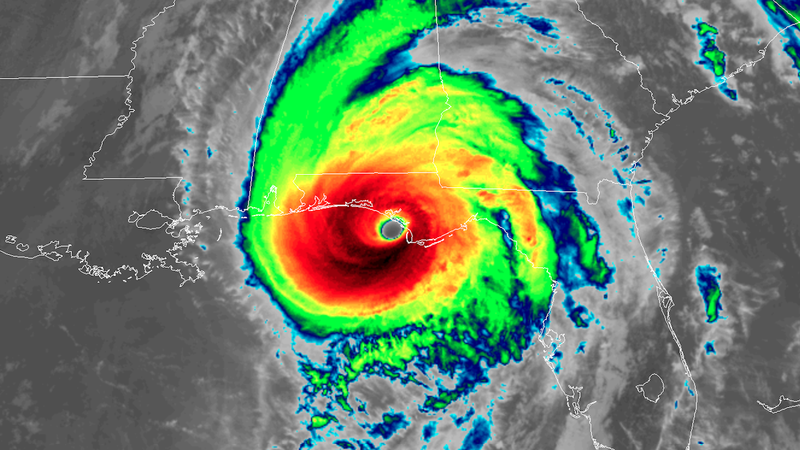 Maybe 2019 will be it's own unique El Nino year similar to how 2018 was unique. 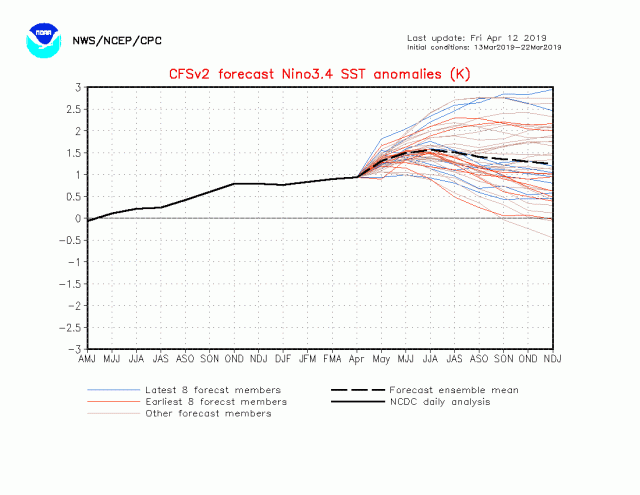 No change to Niño 3.4 on the CPC Weekly update as it remains at +0.9C for a second week in a row. Having a weak double Niño would be a very rare occurrence. Most second year Niños of multiyear events are quite strong. There's also certainly a chance this Niño dissipates sometime in summer and neutral conditions prevail by fall. CyclonicFury wrote: This certainly isn't 2015. Do you have an image to back that up? The latest Enso prediction from the BOM, Euro and others shows warm neutral - weak El Nino for September. The Spring barrier is still present so take this with a grain of salt. 2017 was significantly cooler. It never even approached the heat there currently.